Periodontal disease (also known as gum disease and periodontitis) is a common inflammatory condition which affects the supporting and surrounding soft tissues of the tooth eventually the jawbone itself when in its most advanced stages. Periodontal disease is most often starts as gingivitis, which is a bacterial infection that causes inflammation of the gum tissue. A bacterial infection affects the gums when the toxins contained in plaque begin to irritate and inflame the gum tissue that starts swelling. Once this bacterial infection colonizes in the swollen gums pockets between the teeth starts to form, and it becomes much more difficult to remove and treat. 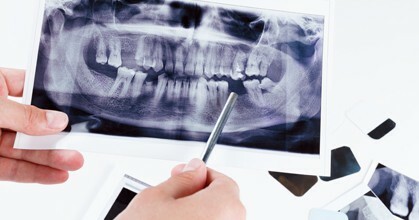 Periodontal disease is a progressive condition that eventually leads to the destruction of the connective tissue and jawbone. If left untreated, it can lead to shifting teeth, loose teeth and eventually tooth loss. When left untreated, gingivitis (mild gum inflammation) can spread to below the gum line. When the toxins contained in plaque irritate the gums, a chronic inflammatory response causes the body to break down and destroy its own bone and soft tissue. There may be little or no symptoms as periodontal disease causes the teeth to separate from the infected gum tissue. Deepening pockets between the gums and teeth are generally indicative that soft tissue and bone is being destroyed by periodontal disease. 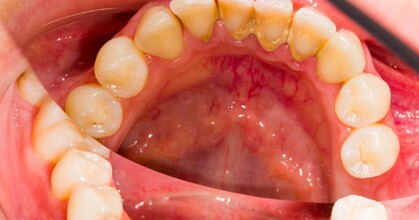 Periodontitis caused by systemic disease– This form of gum disease often begins at an early age. Medical condition such as respiratory disease, diabetes and heart disease are common co-factors.